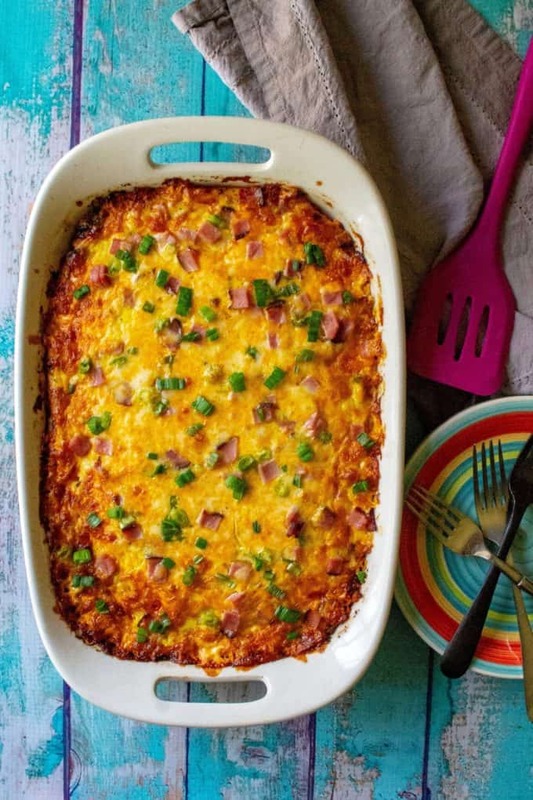 Ham and Cheese Hash Brown Breakfast Casserole is the perfect combination of hash brown potatoes, eggs, ham, cheddar cheese and ricotta baked together to serve up a hearty breakfast casserole to any hungry crowd. 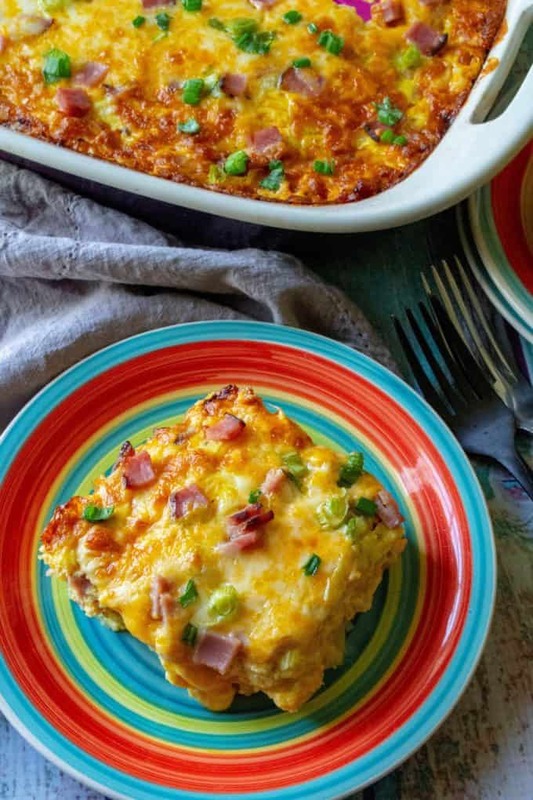 Perfect make ahead breakfast or throw together the morning of, this Ham and Cheese Hash Brown Breakfast Casserole is a crowd pleaser every time! It’s always fun to have a secret. When you know that one piece of information that would both shock and amaze the people sitting at your breakfast table as they scarf down your famous breakfast casserole, you smile a little bit more, laugh a little bit louder, enjoy your early morning grub that much more…. right up until you can’t hold it in one minute longer and then it comes hurtling out and then it is a secret no more!! What am I talking about??? What does this have to do with Ham and Cheese Hash Brown Breakfast Casserole? I am talking about… the secret ingredient. 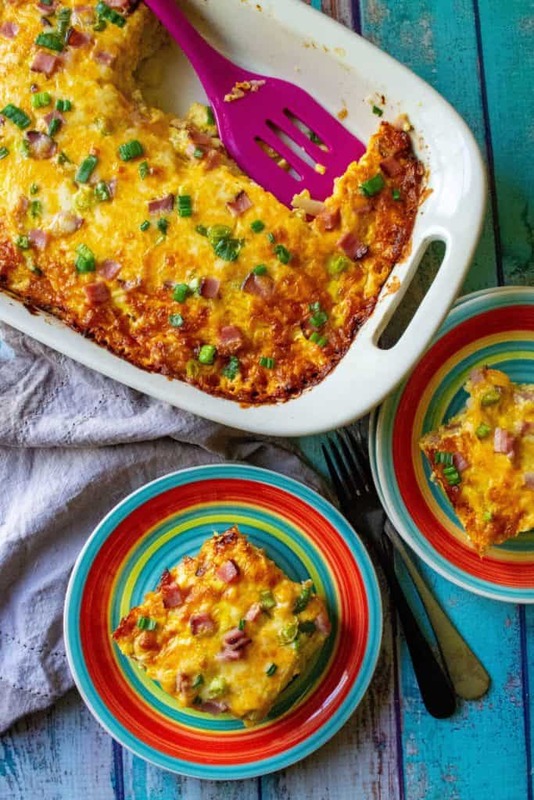 You can hit up your favorite search engine on that thing we call the World Wide Web and you will find approximately a billion recipes for Ham and Cheese Hash Brown Breakfast Casserole. Over and over again you will read to add eggs and meat and cheese and then bake it and then there’s your casserole. They are all perfectly good recipes, some with meat, some without, some with cheese, some without (I don’t understand that), some with veggies … well, you get the idea. And dare I say, we have all been at work on Potluck Day when someone brings in a perfectly good breakfast casserole and we are satisfied… but oddly left lacking. In all the billions of easy breakfast casserole recipes, is there one recipe that just stands out about the rest? Yes. 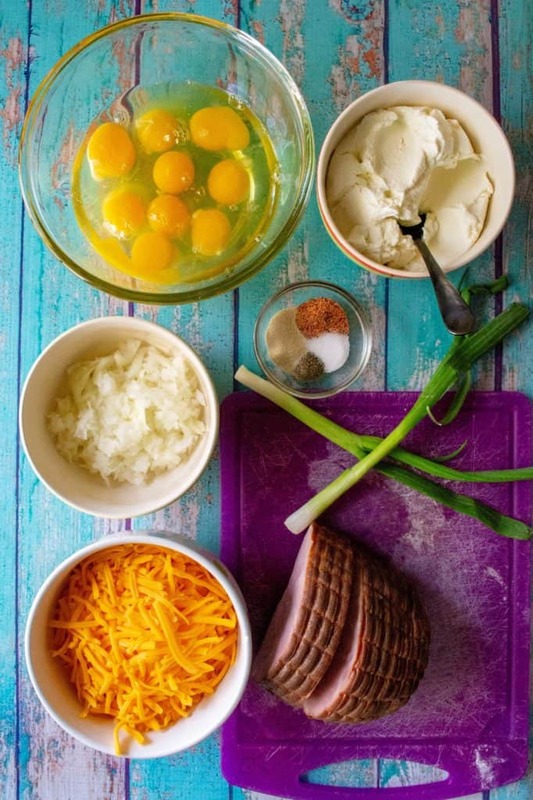 And I will even tell you the secret ingredient of the BEST ham and cheese breakfast casserole … ricotta cheese. Yes, you read right. 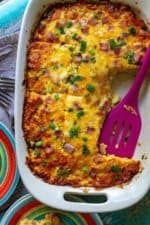 Ricotta cheese gives this easy ham and cheese casserole new life and if you look through those other billion Ham and Cheese Breakfast Casserole recipes, I bet you don’t find it mentioned too often. Believe me, once you try this you will never go back to plain breakfast casserole again. I promise! 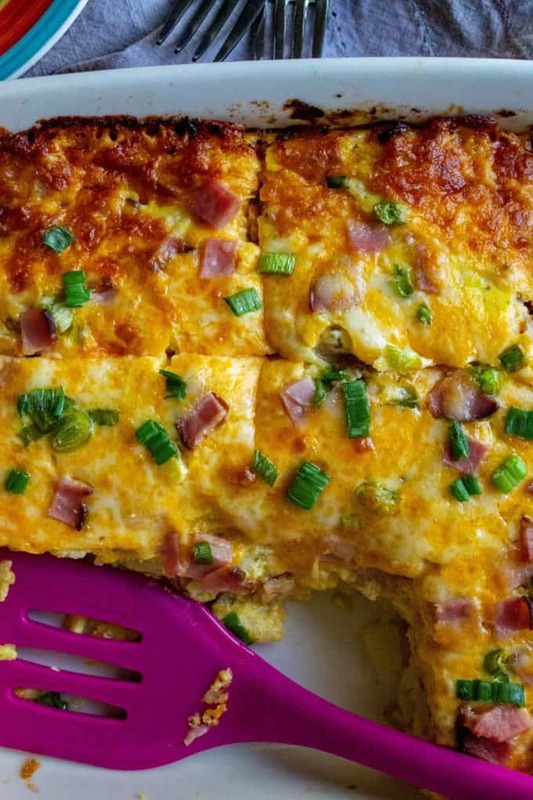 This is truly the best Ham and Cheese Hash Brown Breakfast Casserole I have ever made. And before anyone shakes their head at this, you cannot taste the ricotta but it definitely makes the casserole creamy but not in a gross egggy way. As a girl who is not a huge fan of ricotta and even less of a fan of eggs, believe me.. you will LOVE this!! There are so many different ways to make this, add the ingredients you like best because any way you make it, it will come out perfect and you will be the hero of pre-noon food. So when everyone is begging you for the recipe and asks what is it that makes your breakfast casserole so good?? .. just smile, because YOU know the secret. 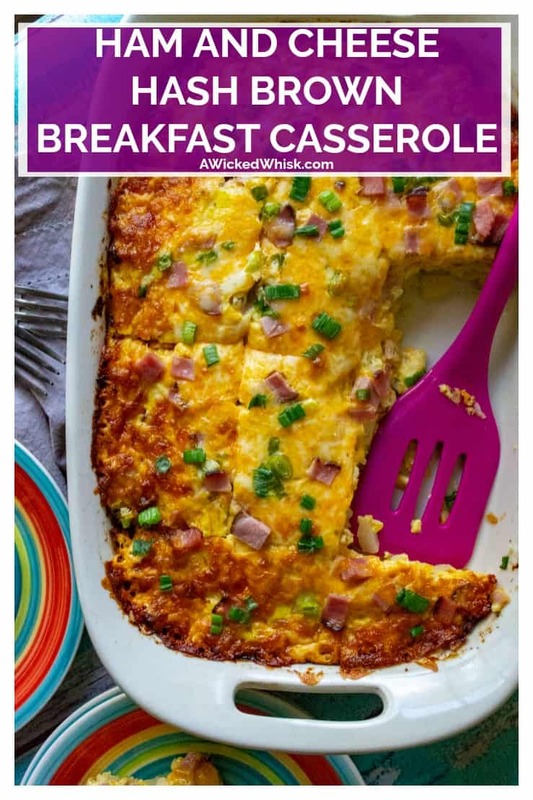 Now one thing I love about easy breakfast casseroles, other than how many different ingredients you can mix and match, is how this is the perfect breakfast for entertaining. Talk about an impressive breakfast or brunch to serve up to your friends and family. And let’s not forget about how perfect this breakfast idea is on those super busy, super hectic, super CROWDED holiday mornings. This is such an ideal way to feed a hungry holiday crowd with next to no effort whatsoever. That right there is a priceless gift for YOU! This super easy breakfast recipe can be made ahead of time to save you the time from being away from your guests or it can be thrown together the morning of. 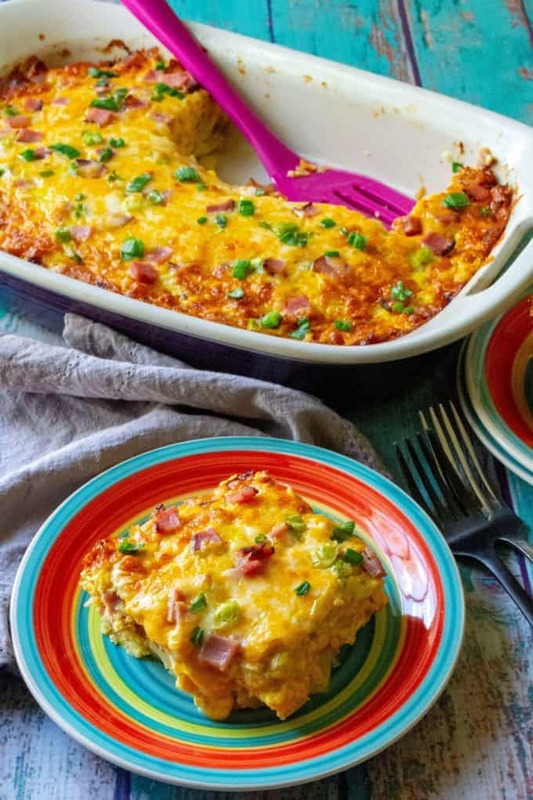 Heck, you can even make this Ham and Cheese Hash Brown Breakfast Casserole, freeze it and have it on hand for whenever you need it. To make this the night before, simply bake your hash browns / potatoes as instructed and then remove from the oven and let cool. 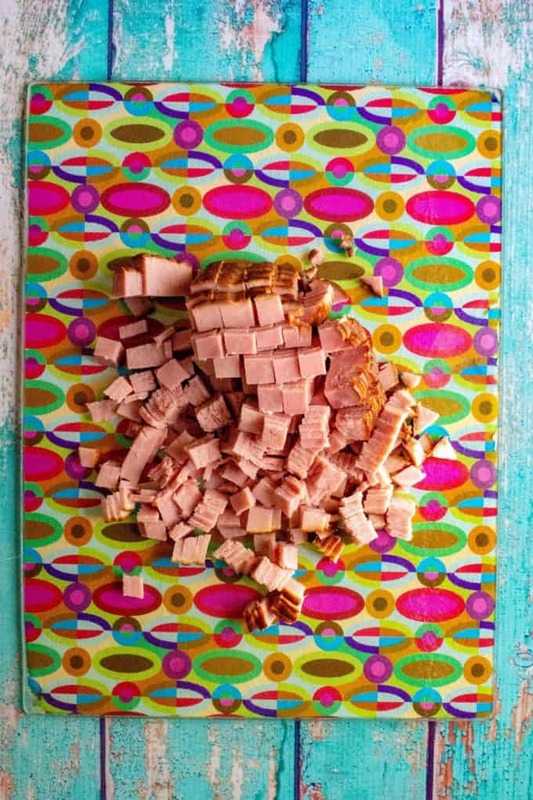 Layer on your shredded cheese and ham, cover in plastic wrap and store in the refrigerator. The next morning, combine the eggs, ricotta, onions and spices and pour over the ingredients in your pan. Bake as instructed but add on an extra 10-15 minutes. 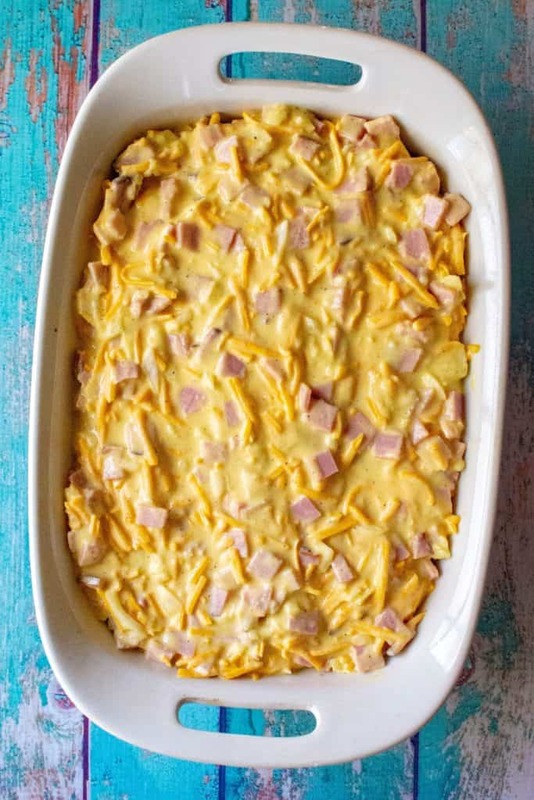 If you would like to FREEZE this ham and cheese breakfast casserole for later use, bake as instructed in a disposable foil pan and cool completely before freezing. Wrap your breakfast casserole well in more foil and freeze. Defrost in the fridge the night before you need will be serving and then cook in the oven for 30 minutes at 350 or until warmed through. This easy breakfast casserole can be changed up more ways then I can count. Add in whatever breakfast meat you like from bacon to sausage to turkey sausage to ham.. heck .. add all three if you want to serve up an extra hearty breakfast. Cheese is also able to be changed out if Cheddar cheese isn’t your jam… add in Monterey Jack, Havarti or even Swiss cheese if you want a bit of variety. Easy! Start by preheating your oven to 450 degrees and pouring your hash browns or breakfast potatoes into a buttered 9×13 casserole dish. Pour melted butter evenly over your potatoes and bake for 30-40 minutes or until your potatoes have started to crisp. Remove from oven, reduce heat to 350 degrees and in a large mixing bowl, combine eggs, ricotta and spices. Stir in shredded cheese, onion and ham (reserve some of the cheese and ham for later). Pour your egg mixture over your hash browns / breakfast potatoes and bake for 55-60 mintes. 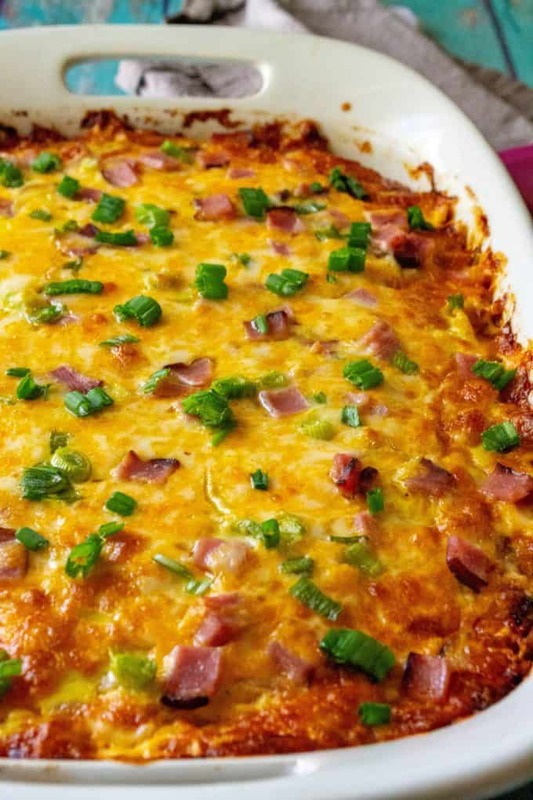 About 20 minutes before your breakfast casserole is done cooking, sprinkle with reserved shredded cheese, breakfast meat and green onions. When done, remove from oven and serve immediately. Start with pre-cooked meats and ready to cook hash browns or breakfast potatoes. I buy the chunks of cooked / sliced ham and the Simply Potato breakfast potatoes. You can make homemade hash browns but sometimes I am happy to let the supermarket do the work for me. Skip the pre-shredded bags of cheese from the grocery store. They produce an oily type of cheese and no one likes to serve up a greasy breakfast. Take the extra 5 minutes to shred block cheese yourself. Save some of your breakfast meat to the side and when your breakfast casserole is about 20 minutes away from being cooked, sprinkle on some shredded cheese, the reserved meat and some green onions. 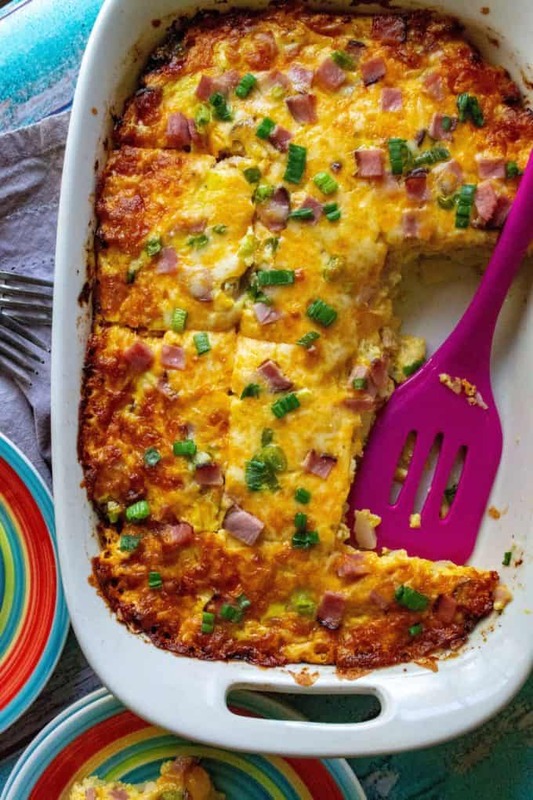 Your ham and cheese breakfast casserole will be extra pretty to serve up to your loved ones. Start by preheating your oven to 450 degrees and pouring your hash browns or breakfast potatoes into a buttered 9x13 casserole dish. 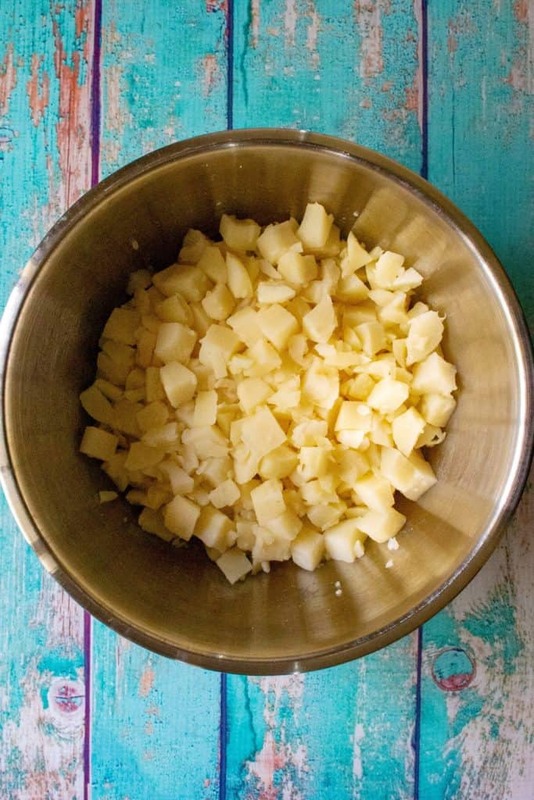 Pour melted butter evenly over your potatoes and bake for 30-40 minutes or until your potatoes have started to crisp. Remove from oven, reduce heat to 350 degrees and in a large mixing bowl, combine eggs, ricotta and spices. Stir in shredded cheese, onion and ham (reserve some of the cheese and ham for garnishing later). I am not a fan of ricotta either. But I am going to try this recipe!! Thanks that you make it so fun to read your receipes!! Thank you Denise.. I hope you like it!! Okay, so I LOVE ricotta, but never thought to use it in a breakfast casserole! You little genius, you! This looks so amazing. can you make this ahead, like bake the crust and put in fridge and then in the morning add rest and cook? Yes.. I have done that before. Simply make your crust the day before and refrigerate it.. heat it up in your preheated oven for about 10 minutes while you are making the filling. Enjoy!